This is a cool paddling story in the true spirit of John “Rob Roy” MacGregor. Two paddlers, Alastair (the author) and Seumas, published a periodical for young boys called Claymore. Its goal was to promote Scottish culture and a thirst for adventure among its young readers. When the magazine fell into financial collapse, the two men, like many that have taken long expeditions, saw unemployment not as a failure, but an opportunity. They turned their attention to an adventure of their own. They had two 13 1/2-ft. canoes built in skin-on-frame, each with a 32-inch beam. Since most shores in Scotland are shingle, the bottoms were sheathed with strips of wood, so their resulting weight came to 80-pounds. The canoes were in three pieces, held together with a wire running from one end, through a groove under the hull and to the other end, and tightened by two turnbuckles. The adventure was in the mid-1930’s, between the two great wars. They never said what year it was, but later in the book spoke of encountering the Yacht Endeavor as it was campaigning to compete in the America’s Cup. That would place it in 1934. The trip didn’t start until late August, so a common admonition was that they had started too late in the year. 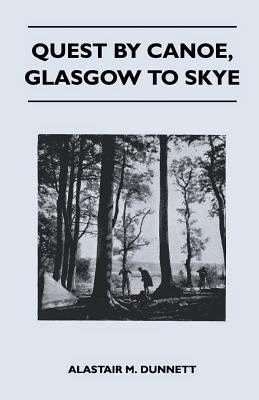 They would paddle from Glasgow through the Scottish Isles to Skye. With stories of their trip published in local papers, they became known as the Canoe Boys, and their movements were closely watched by those that gathered along the shores and at each landing. By this point, the calendar had progressed to the end of October, their canoes and lines were rigid with ice, and bad weather was becoming relentless. In fact, even the steamship that transported them and their canoes back to Glasgow had to anchor in a bay for two days because the storms were too great for a ship to endure. So, for a peek back in time, and a view of the lives of Highlanders in the Hebrides, you’ll enjoy how this canoe trip weaves all these experiences together.